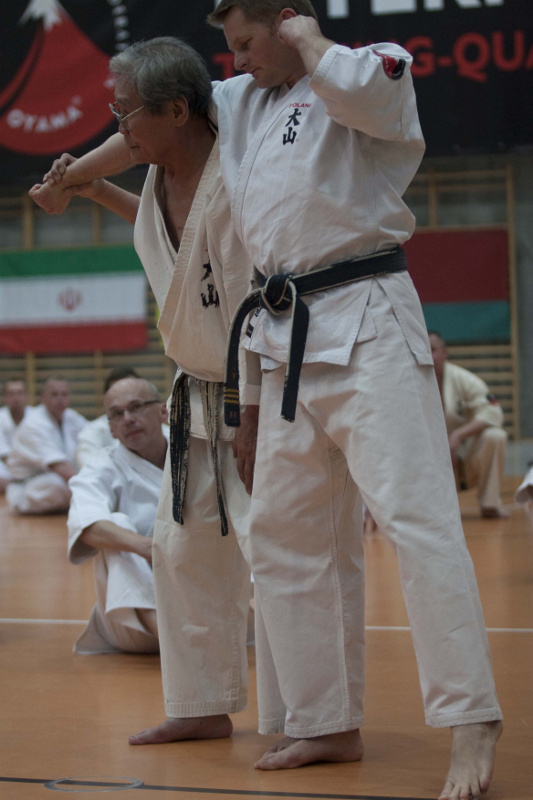 Grand Master Shigeru Oyama 10thdan came to Krakow, invited by Hanshi Jan Dyduch 8thdan and the OYAMA Polish Karate Federation. Soshu conducted a seminar and a two day black belt promotion test. Nearly 300 instructors and students from Poland, Russia, Belarus, Ukraine, Estonia, USA, Germany, Ireland , Azerbaijan and Iran participated in this event. Meeting was organized with a support from The City of Krakow. OSU! 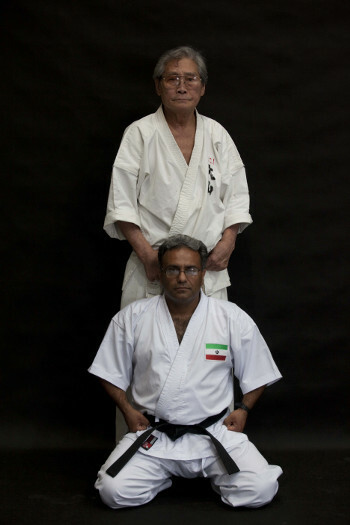 Soshu Shigeru Oyama and Shihan Hossein Moghadasi from Iran. During the meeting Country Representatives and Branch chiefs of OYAMA IKF gathered for an international council lead by Hanshi Jan Dyduch 8thdan. Rules and the calendar of the schooling and sport events for the years 2011-2013 were debated and taken in to consideration. On June 5th Soshu Oyama conducted a Seienhin kata training. Grand Master presented applications characteristic for the period of time when the kata was created and the evolution of this classical form. After one and a half hour brake a two day black belt test started. Grand Master lead the technical part of the exam. The first day for the candidates above 35 years. June 6th, the people under 35 years of age were taking the test. In both age groups technical tests covered the presentations of all techniques, combinations, kihon kata, advanced kata and also formal presentations with weapons: Bo, Tonfa, Sai. 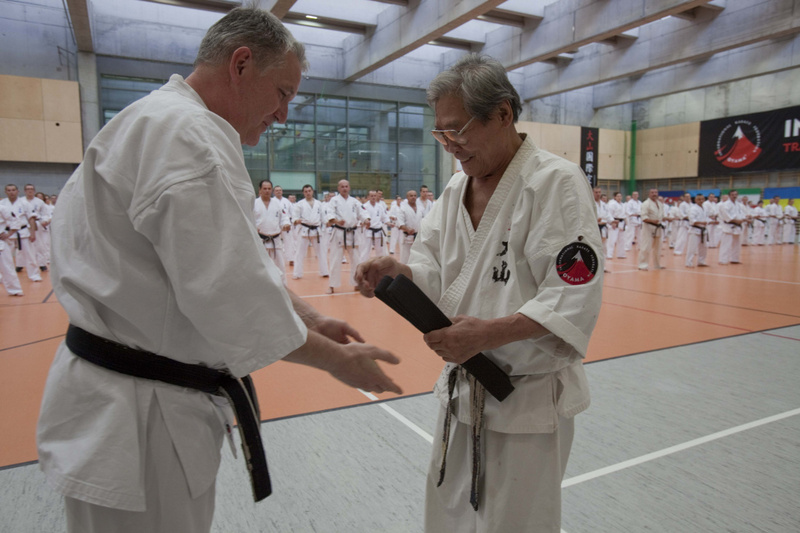 During the opening Ceremony of the kumite test, the creator of the Oyama style presented Hanshi Jan Dyduch with a belt for the 8th dan. He also handed the 5thdan certificates for Pawel Pajdak and Witold Choinski along with the right to use a title Shihan. Our sincere congratulations, OSU! On behalf of all the nominated, Jan Dyduch thanked the Grand Master for those high nominations, underlining their great effort and impact the both new Shihan Pajdak and Choinski have in the development of Oyama karate in Poland. Hanshi addressed the gathered people and thanked for their trust, support and the daily training effort. I quote: “ It is thanks to you and the effects of your work we have been honored with those high belts” Hanshi Dyduch said. After that Shihan Andrzej Pierzchala 5thdan thanked Hanshi Jan Dyduch for a long lasting successful management of OYAMA PFK and for preparing the candidates for the promotion test. During the kumite test, the candidates for the 1stdan had to last for the 15 fights, each one with a rested opponent. As usually these were tough fights. Sparing – partners forced the participants to overcome their weaknesses. At the end of the exam Grand Master highly appreciated the skill lever of the candidates. Soshu congratulated Sensei Roman Oraczko 2nd dan his good appearance in the 3rd Global Point and K.O. Karate Championships in Japan. During the evening hours there was an official Sayonara Party with 280 guests attending. Including the participants of the exam, their relatives, chiefs of Oyama karate clubs and invited foreign guests. During the official part, Hanshi Dyduch thanked the Grand Master and his wife for coming to Poland. Our guests received flowers and numerous gifts. The Sayonara Party had an honor to host Mrs Barbara Mikolajczyk – the Director of the Division of Sports and Social Initiatives of the Krakow Town Hall. Lady Director received a warm welcome followed by a great applause for coming and financial support of the meeting by to City Officials. 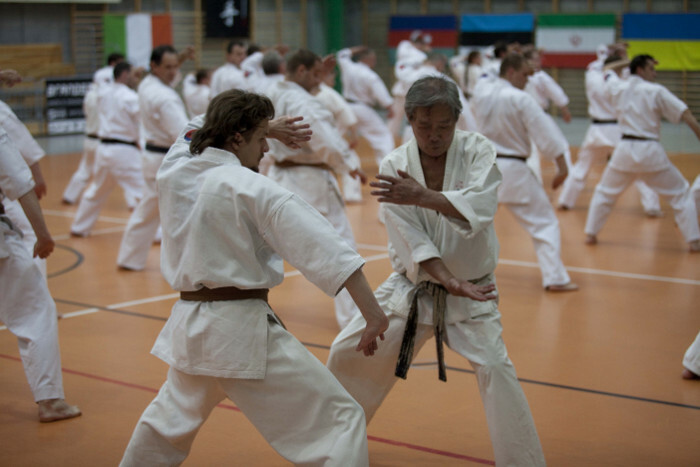 Sensei Valery Savitsky 3th dan, host of the European Championships OYAMA IKF, Estonia’2011. During the official part Grand Master handed the OYAMA IKF license for the current Country Representatives and Branch Chiefs. Hanshi Dyduch presented the foreign guests with the diplomas for attending the seminar and numerous gifts. In the free time our foreign guests saw the monuments of Krakow and a World famous salt mine in Wieliczka. All that under a watchful eye of Sensei Robert Bretner 4thdan. OSU! WE WOULD LIKE TO THANK ALL THE PARTICIPANTS OF THE SEMINAR FOR THEIR ACTIVE PRESENCE AND FRUITFULL COOPERATION.